Her work spans complex ancillary relief, public law and she has reached a high level of specialism in her niche practice in international cases, including child abduction, overseas adoption and divorce. 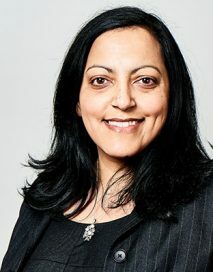 Ravinder is often the first port of call in cases with an international element, where she provides speedy and pragmatic advice. Ravi deals with all aspects of high conflict private law and public law, including forced marriage, factitious illness, sexual abuse, serious non accidental injury with complex medical evidence. She is regularly instructed in complex matters by the local authority, parents and guardians. She is recognised for her forceful advocacy and strong tactical skills. She is a calm presence in court and leaves no stone unturned in her meticulous preparation. Ravi establishes a quick rapport with her clients and takes full advantage of technology in using video and Skype conferences where this will assist the client. She has experience of dealing with vulnerable adults in Court of Protection cases as well as representing the local authority in this arena. Ravi has advised local authorities and police authorities regarding policies in forced marriage cases. She was invited to draft the authority policy in FGM cases so that s standardised approach is adopted and that there is a local protocol for regular police liaison. Re AW (2016) – Represented the local authority in a contested adoption before Bodey J. The case is now the subject of an appeal where permission to appeal has been granted by the Court of Appeal. Re P (2015) -Instructed by the solicitor representing the 17-year-old mother of an infant, who had sustained a leg fracture. The matter was listed for a 5 day fact finding hearing. The medical evidence pointed towards a non accidental injury. Cross-examination of paediatrician and radiologist. The court found that there was not sufficient evidence to meet the threshold criteria as alleged by the local authority. The child returned home some 10 days before Christmas. Re A (2015) – instructed for the mother in a case involving child abduction and Dubai. Re AR(2015)- Instructed by local authority in a contested application for a reporting restrictions order listed in the High Court. The Respondents included Facebook and Google. Re AW (2015) Instructed by the local authority in a High Court contested adoption. Factually complex background with Paternal grandparents contesting the adoption. They did not know of the baby’s existence until the adoption application was made. Re K v A (2015)- A High Court matter where the court had to determine habitual residence and the ability of the UK courts to make orders in relation to a child who was a Kenyan national studying in the UK and had alleged ill treatment by a parent. Against Leading Counsel. Re D (2015) – Hearing including ground rules hearings procedure for client with learning difficulties. Re H (2015) High cost care case dealing with risk of sexual harm posed to child.